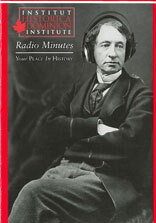 More than 100 of Canada's defining moments and personalities - from the world's first commercial jetliner and Jackie Robinson to Alice Munro and Vimy Ridge - are captured in these 90-second dramas heard on radio stations across the country. “Never was a country better adapted to produce a great race of women than this Canada of ours, nor a race of women better adapted to make a great country,” stated Emily Murphy, Canada’s first female magistrate. Murphy ensured that women won their legal rights in the famous Persons Case. The important milestones in the development of our democratic institutions are anything but dull. The struggle toward self-government in Canada includes stirring tales of patriots such as Louis-Joseph Papineau and martyrs of the 1837 rebellions. It also includes the important work of moderate reformers who advocated effective elected representation. The partnership of Louis Hippolyte LaFontaine and Robert Baldwin showed that French and English Canadians could work together to solve their political problems. Canada's crowning achievement in the year of its centennial was Expo 67. One of the most successful international exhibitions of the 20th century, Expo 67 gave Montréal the opportunity to show itself as a world-class city and proved once and for all that Canada had come of age. But Canada's international reputation was formed on more than just expositions. Canada also has a history of human rights advocacy and humanitarian generosity. John Humphrey made human rights a matter of global concern as the author of the Universal Declaration of Human Rights. Centuries ago the Iroquois nations found a way to establish peace and unity among themselves. The Great Peace, dramatized in Peacemaker, can be traced back more than 1,500 years and has lasted to the present day. A hero is someone who is willing to put himself on the line to help others. Heroes are often ordinary people who make extraordinary decisions in times of crisis. Maurice Ruddick, one of the few black men employed at the Springhill mine in Nova Scotia, saved the lives of six other miners when they became trapped. Making a home in Canada has always involved hard work and overcoming obstacles. Between 1840 and 1860, more than 30,000 American slaves came secretly to Canada and freedom. They were aided by &quot;agents&quot; on the Underground Railroad - men and women, white and black, Canadian and American.